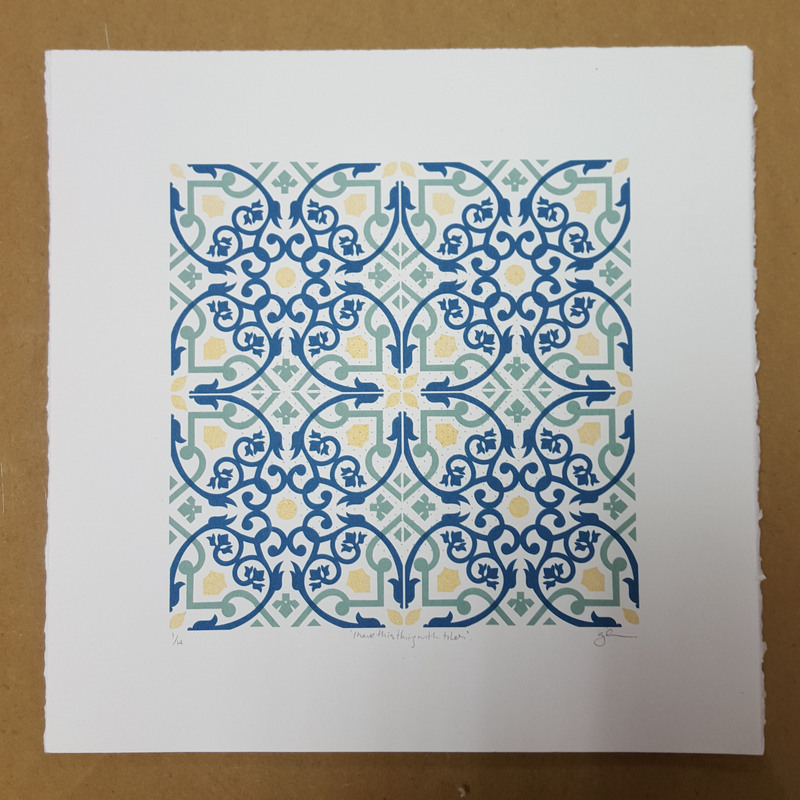 I Have This Thing With Tiles is inspired by Henderson’s trips to Andalusian Spain. Through exploring the Spanish tiles, known worldwide for their detail and colour, Henderson dissects the character that can be brought to a space, arguing that the spaces themselves (whether that be on a floor,wall or exterior of a building) can be described as works of art. Proof that from a simple design a complex pattern can be created. Henderson sketches from photographs taken in situ, transforming them into simple vectors which she later exposes individually onto a mesh screen. Through layered printing she builds her once simple design into a complex pattern. By varying her base material, often working on paper, textiles and wood, she again refers back to the transformative qualities tiles can hold. Floral Repeat is a self initiated project designed and printed by Henderson. The influence for the design came while renovating a building in Portobello, Dublin, after the pulling back of plaster board revealed the retro 70’s pattern. Henderson laboriously reworked the design through sketches, eventually creating a vector and exposing it onto a mesh screen. 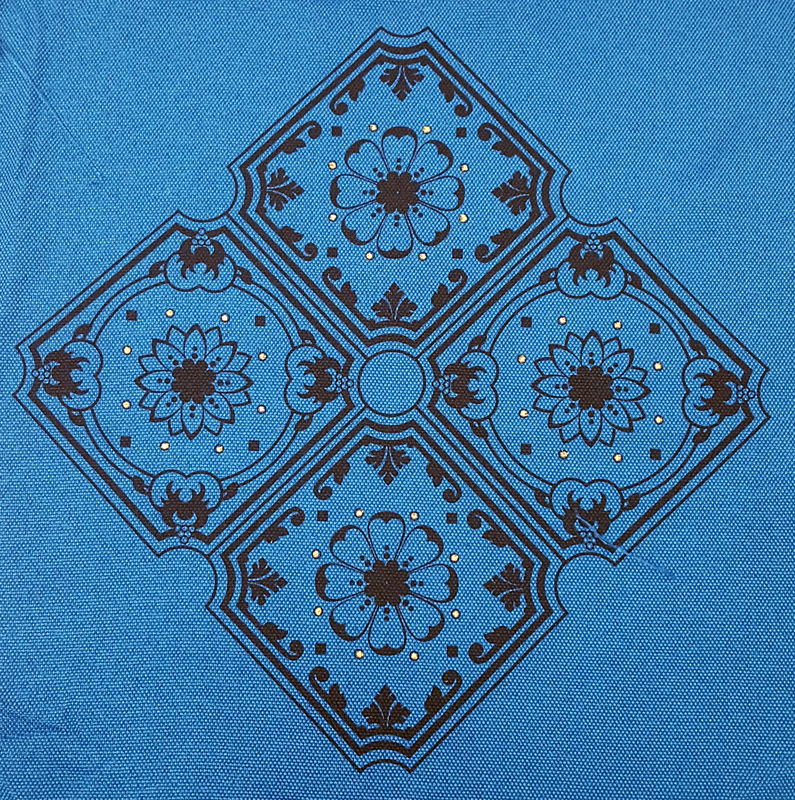 Rather then print onto paper Henderson chose to print this design onto fabric. The piece on display is a bespoke piece, hand pulled screen print on 100% cotton fabric and framed exclusively for the Halftone exhibition. Requests can be made for alternative colours and fabrics. Gillian Henderson graduated from University of Ulster in 2010 with a First Class Honours degree in 3D design, product and furniture. At present Henderson works in Hang Tough Framing in Dublin, the framing choice for contemporary art and prints. Henderson has been screen printing since 2012 after an extensive course in Black Church print studio. Her work is designed and hand printed, in house, at her Dublin based studio. Henderson regularly collaborates with artists and designers on limited edition prints, packaging and textile pieces all through a screen printed medium.